Are you looking for a rewarding job that makes a REAL DIFFERENCE to young people’s life? Do you have PASSION for TRAVELING, OUTDOOR TRAINING with memorable LIFE EXPERIENCES? Do you want to DISCORVER yourself, step BEYOND THE LINE? Do you want to have a chance to be TRAINED by FOREIGN EXPERTS to become a professional instructor in our outdoor courses? Apply now to join our Outward Bound Instructor Trainee Team! Outward Bound Vietnam Instructor Trainee program is an avenue for students at final year’s University / College, just graduated, and students graduated for few years who are interested in outdoor training, have spirit of being-ready to face challenges to become an Outward Bound Instructor. Instructor Trainees will be trained by Outward Bound Vietnam Instructors regarding different skills connected with outdoor activities, soft skills, safety procedures and necessary medical procedures have opportunities for being training assistant and be trained to become professional instructors. Instructors will lead the Instructor Trainees, guide them skills, setup standards and targets of the course, and also create a good studying environment, with friendly gesture, supportive spirit and quickly recognize the demand of participants. 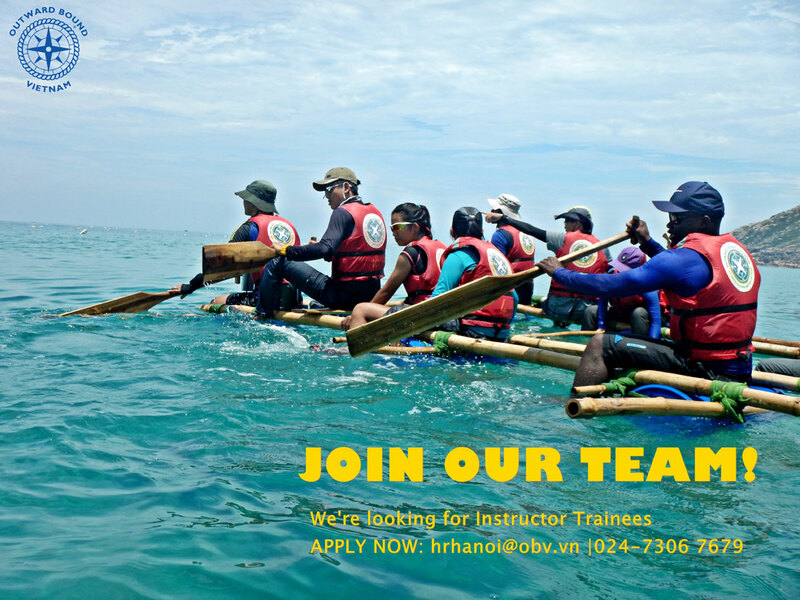 After being carefully trained, you will become a full-time instructor of Outward Bound Vietnam. Proceed to teach outdoor training courses at Outward Bound Vietnam for different customers. This requires the Instructors be flexible to work in many other places. Be able to build important soft-skills such as resilience, teamwork, communication, initiative, and other similar character based values. Become one member of the Instructor team, working in a fast-paced and co-operative team environment to create safe and inspiring courses. Undertake different roles when taking care of young people outdoors. For example: the leader, the coordinator, instructor and adviser. Make plans and propose activities, lessons learnt by experience for youth, to ensure all targets of the course. Meet the customers and propose necessary information before the course to ensure all targets and purposes of the course. To be in charge of technical supporting for Instructors in activities such as climbing up mountains, rowing, activities requiring supports from guiders and supporting sources for the program. Work in the evening and weekends when required by training program. Develop personal skills and personal abilities. Take care of safety equipment and report damages to the person in charge. Proceed the administration task to ensure a safe and effective operation for the courses. Hung Thang Urban & Service Area, Hung Thang District, Ha Long City, Quang Ninh Province. Be able to communicate in English is essential. Candidates have suitable experience and/ or have background connected with sport or outside activities will be given priority. Have good health to join all activities of the course, maintain energetic health to focus on supporting students and Instructors. Priority will be given to those who have working experience with young people regarding activities at cities and mountainous regions or used to be members of team/ education or personal development organizations.